I love creating new designs for my customers especially when it is something completely new like a "Tough Mudder" party. 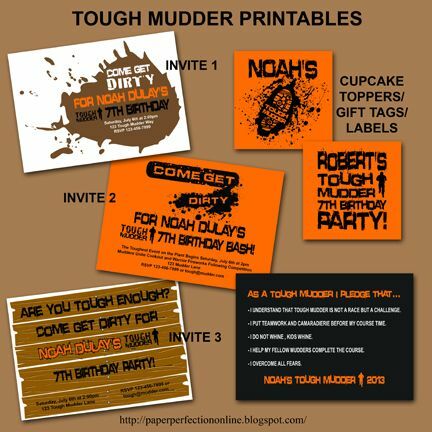 Here are a few invitations, cupcake toppers and a Tough Mudder pledge card that I created for one mom that wanted to have a Tough Mudder party for her son's birthday. You don't have to have a 10-12 mile course, just a fun obstacle course that kids can compete on during the party. If you would like one of these party printables or a custom design for your next event contact Paper Perfection at jtanddolly@yahoo.com for pricing and details.